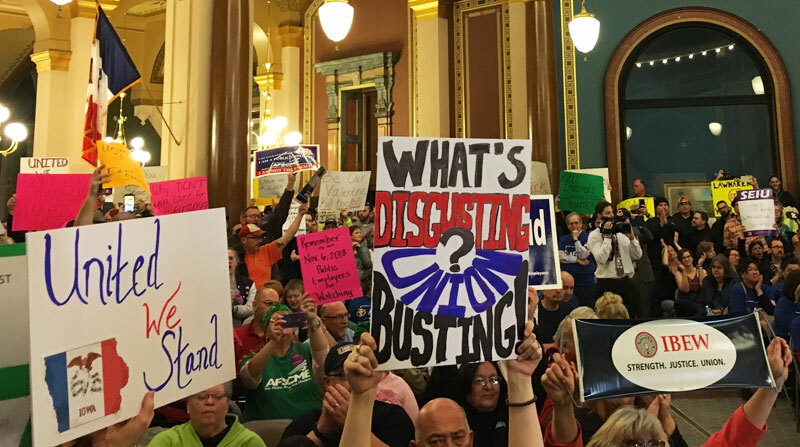 Critics of the collective bargaining bill flowed into the Iowa State Capitol. 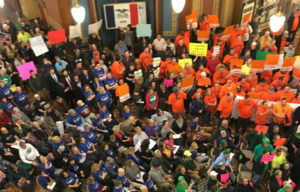 Wisconsin Governor Scott Walker spoke privately via Skype to Republican legislators in Iowa today, encouraging them to embrace the same kind of collective bargaining changes he enacted in Wisconsin six years ago. 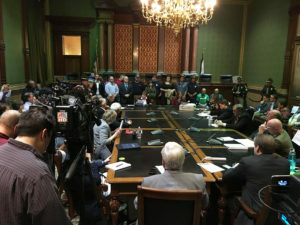 There was a two-hour public hearing at the statehouse tonight about the bill the Iowa House and Senate are preparing to debate tomorrow. 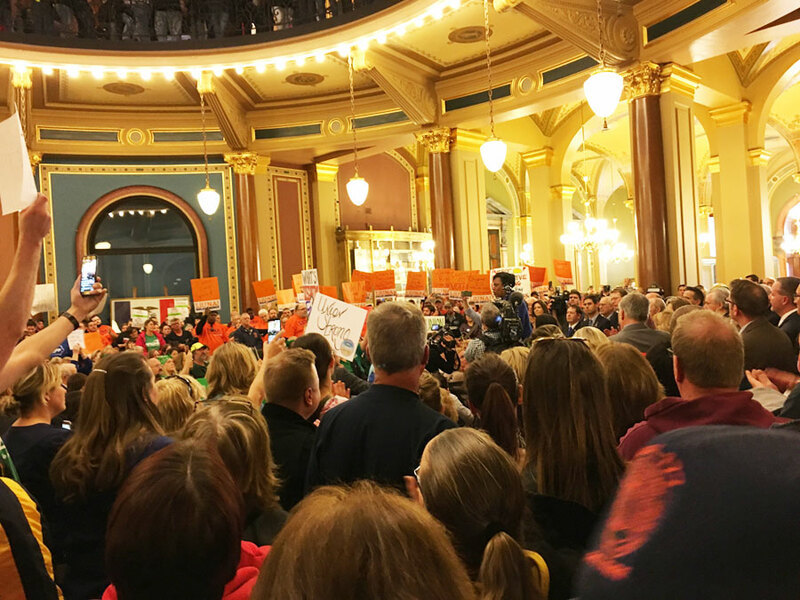 A huge crowd — often chanting: “kill the bill” — turned out to voice their opposition to the Republican-backed measure. 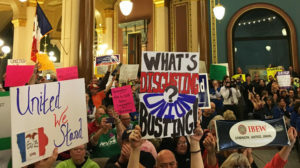 Critics say the bill “guts” Iowa’s collective bargaining law for public employees, leaving base wages as the only item unions and management may negotiate. 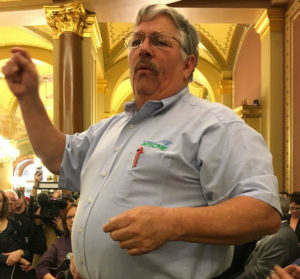 Rick Scott of Lawton, president of the Amalgamated Transit Union based in Sioux City, represents workers for bus systems in Sioux City, Cedar Rapids, Davenport, Des Moines and Waterloo. “Just because you have the political power to do something does not mean that it’s the right thing to do,” Scott said during tonight’s hearing. Kerry Gruenhagen, a small business owner from Walcott, said “thousands of Iowans” believe their tax dollars are “too easily” spent. Wisconsin’s governor tweeted about his private talk with Iowa’s Republican legislators. Walker also posted a picture of the massive protests in Wisconsin over his actions in 2011. He told GOP lawmakers in Iowa that Republicans in Wisconsin have gained seats in that state’s legislature since then. Tonight’s public hearing was staged in an Iowa capitol committee room, with the overflow crowd spilling into the hallway, out into the first floor rotunda, up the capitol’s Grand Staircase and onto the second floor. Three dozen people who opposed the bill spoke during the hearing. Drew Klein, state director for Americans for Prosperity, was one of four people to speak in favor of the bill. Lindsey Herron, a correctional officer at the state women’s prison in Mitchellville, said she took a pay cut because the benefits outweighed the pay. A crowded State Capitol rotunda. “Please consider slowing this process down and having a real conversation with those of us directly affected by this bill,” Wawro said. However, it appears Republicans are likely to debate the bill in both the House and Senate tomorrow. Senator Nate Boulton, a Democrat from Des Moines, climbed on a chair late this afternoon to speak to the throng of union members about that upcoming debate. 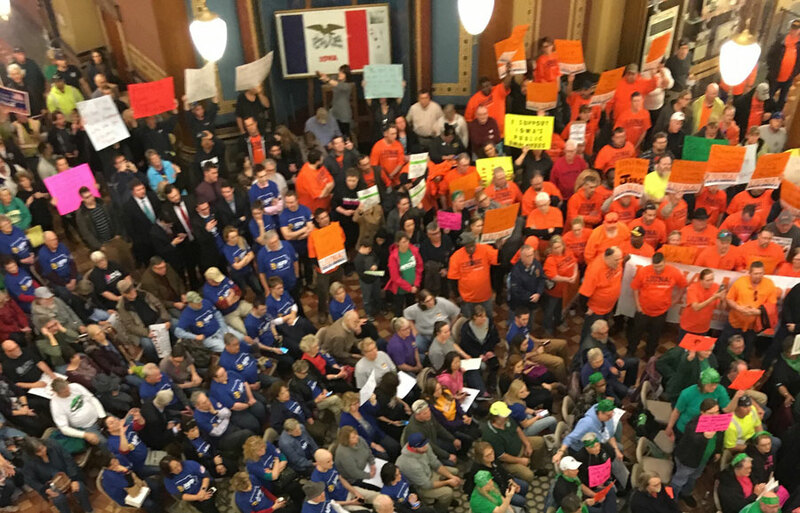 “We stand together with Iowa’s public sector employees who stand up for our communities and we are with you 100 percent,” Boulton said, to loud cheers from people on the first floor and the overflow crowd looking down from the second floor of the rotunda. Danny Homan, president of AFSCME Council 61 — the union that represents state and local government workers, was the rally’s closer.